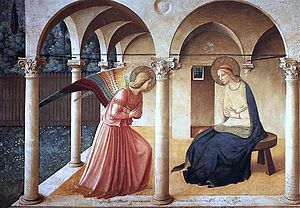 A blessed solemnity of the Annunciation, which has been transferred this year from March 25th (which was in Holy Week). Commemorating the conception of the Son of God in the womb of the Blessed Virgin, freely chosen by the young Hebrew maiden Mary, who was given a choice to make: Fiat mihi secundum verbum tuum, which should also be our response to anything manifested as the will of God, whether through an angel of light, or any of the ‘messengers’ of providence whom we may meet in our daily journeys. As Saint Augustine wrote, Mary conceived Christ in her heart before she conceived Him physically. Tradition teaches that she was a virgin, consecrating herself by vow, thus, in all expectation, foregoing her ‘chance’ to be the mother of the Messiah. Yet God often does the unexpected, and chooses the lowly, the meek, the humble, and those who trust most in Him. For the apparent wisdom and strength of the world are not His wisdom and strength, which far surpass anything we could think or hope. O Virgo Maria, ora pro nobis semper. Previous articleThe Mercy of Hell?